The Sabres righted the ship in a big way this weekend, shutting out the Florida Panthers at home and following with a stellar 3-1 win the following day in Winnipeg. The wins put the Sabres at 3-3-2 on the season and squarely at .500 in points percentage. The latter fact being of particular importance given the absence of Jack Eichel and Evander Kane. Getting out of October at or near .500 was a goal I was personally hoping to see the Sabres achieve. It was looking grim after the third period collapse against Philadelphia that was followed by a lifeless home loss to Minnesota. It’s a shame to think that the team simply needed to stay afloat, especially in a season where the goal prior to training camp was to become a playoff contender, but the timing and impact of those injuries really couldn’t have been much worse. As November begins the Sabres are yet another week closer to filling out their top six once again and have managed to keep from floating to the bottom of the league standings where making up ground would be nearly impossible. The play of Anders Nilsson and Robin Lehner had a lot to do with this weekend’s pair of victories. Nilsson’s 33-save performance on Saturday looked much more like the strong performance in Philly than it did the bumpy start against Minnesota. Nilsson again played to his size and controlled the game beautifully. He hasn’t gotten himself in trouble with rebounds this season – a common complaint of his partner, as it would be – as he’s shown an impressive ability to swallow up pucks from nearly any location. Lehner followed Nilsson with an equally impressive outing that would have been a shutout as well had Buffalo not been victimized by a fortunate bounce off the end boards. Lehner’s play on Sunday was hardly his first strong game of the season. He was steady in Buffalo’s win against Edmonton and he carried that on to Vancouver later in that same road trip. A couple of ugly goals against Calgary and the entire team’s lack of effort against Montreal have skewed his play so far, but I feel confident in saying Lehner has been better than many would have you believe in this young season. What was most impressive on Sunday was his ability to control his depth in the crease. As all Sabres fans know, Tim Murray loves big goalies and he boasts a pair of giants in Lehner and Nilsson. One thing that bigger goalies often do is play deeper in the net, using their size to eliminate options. Lehner, however, does a nice job of challenging shooters and really taking away space to shoot by getting out of the crease. This not only allows him to use his size to his advantage but also speaks to the athletic style of play he uses as opposed to a blocking style which would see him playing deeper in the net. There were two occasions in particular where Lehner did a terrific job adjusting his depth in the net to make a big save. The first was on Mark Scheifele in the second period and the second was on Matthieu Perreault on a third period power play opportunity. The first, on Scheifele came after Dmitri Kulikov was beaten on a nasty toe drag on the rush. Nick Baptiste is eventually called for hooking on the play and he’s draped over Scheifele for most of the action. This likely limited the forward’s options in terms of shot selection but it also allowed Lehner to remain aggressive in the crease. 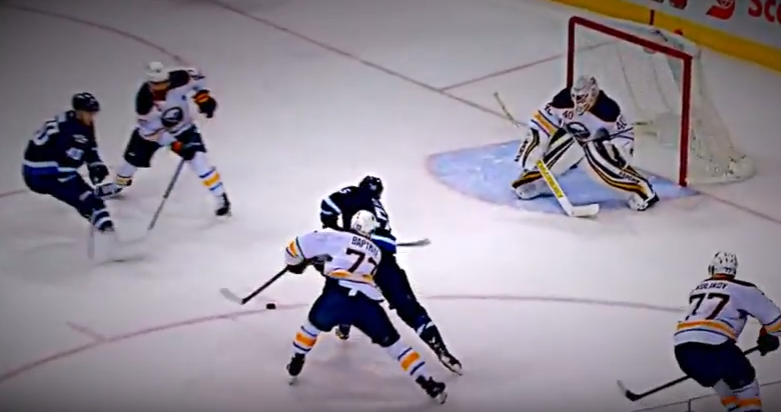 As Scheifele becomes a serious danger, Lehner remains near the top of the crease, not retreating as you would on a breakaway but challenging the shooter. As Baptiste affects Scheifele, Zach Bogosian is doing a good job not losing his man who would be both a pass and rebound threat on this play. 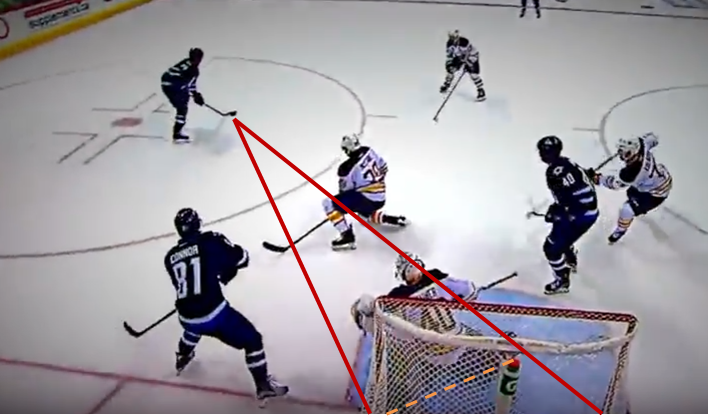 This doesn’t make Scheifele any less dangerous, of course, as he’s in prime position to beat Lehner to the far post with a deke or backhand shot. If Baptiste didn’t come back hard on his backcheck this is likely a goal as Scheifele would be free to deke or shoot forehand from in tight. As Scheifele comes across Lehner’s face the goaltender maintains his positioning near the top of the blue paint. This keeps what Scheifele and the puck sees to a minimum and takes away more holes for the puck to find. The save is ultimately an easy one, in part because of how Baptiste hinders Scheifele. But Lehner’s depth in the net takes away any additional threat that may have been posed by the puck carrier. His positioning also makes it very easy to kick the rebound well out of harms way to the boards. The second period save was something of a precursor to one he made in the third that, in my opinion, was even more impressive than the glove snag Lehner had against Patrick Laine. On one of Winnipeg’s numerous power play opportunities, Lehner made a cross-crease stop on Mathieu Perreault that saw him move side-to-side and out of the crease with near perfect efficiency. The play starts to Lehner’s right but a cross-box pass creates a prime opportunity for the Jets thanks to a very well structured umbrella. 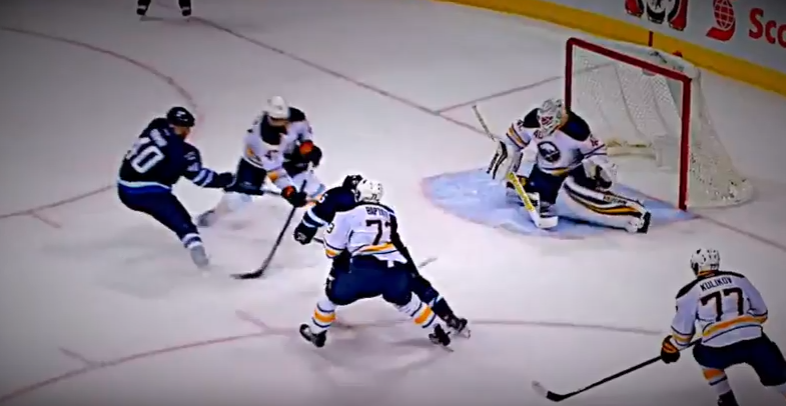 Lehner is on his knees as he arrives at the left post as the threat of a one-timer forces him to be in a position to make an immediate save as he moves from right-to-left. However, as Perreault corrals the puck as opposed to taking a one-timer, Lehner is eventually given a chance to recover. Even though he is already down as the puck arrives – another favorite complaint of many fans – he’s still in good position to make a save as illustrated by the angles the puck sees as Perreault receives the pass. Where Lehner really shines is after the above moment. Many goalies would either remain in their butterfly or simply recover to their feet as Perreault made his choice to shoot or pass. 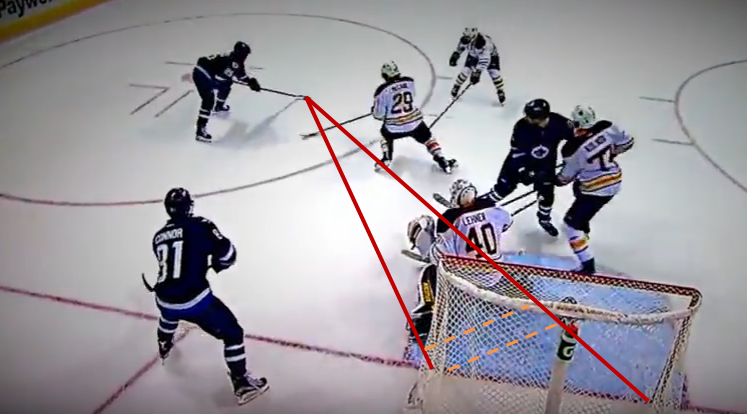 Instead, Lehner uses the post as an anchor and gains depth in the crease to further cut down the angle on Perreault. As illustrated by the dashed orange lines, Lehner gains significant depth off his initial push, taking even more net away from Perreault in the process. Of note, the camera angle here doesn’t perfectly illustrate Lehner’s positional play to the puck in this instance. 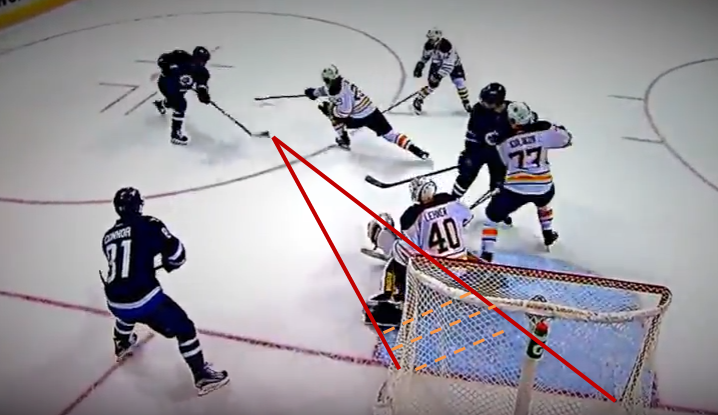 By seeing where his feet are in relation to the angles the puck sees should give a good idea of the position he has in net. 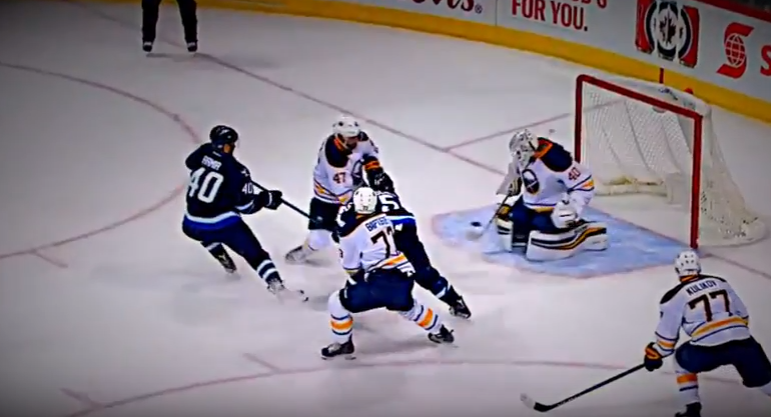 Immediately prior to the shot, Lehner has gained even more depth on the shooter, taking another few inches away from the net in a good, aggressive posture despite remaining in the butterfly. The save is a good reaction stop as well. Perreault tries to beat him short side, high and Lehner’s combination of aggressive play and quick reaction sends the puck up over the glass and keeps the score 3-1. The strong weekend from Buffalo’s goalies bodes well for continued success on what has become a mini win streak for the club. This type of play is exactly what the Sabres were hoping to receive this season from what was seen as a questionable duo.